Thank You, Truly | Crockett Foundation - Tag In & Help Out! As I sit here tonight waiting on the release of Crockett Foundation’s first press release of 2016, one word keeps coming to mind…grateful. In 2015 the Board of Directors of the Crockett Foundation and myself, as president, decided to go public with our quest to help veterans and retired military dogs. For 30+ years we have been helping folks with mental health issues. Going out in the public forum to ask for help in our quest was not a decision we made lightly. But thank God we made that decision. Our minds have been blown by the way we’ve been received with open arms over the last 8 months. We could not have asked for a better response from Jim Crockett Promotions fans and his former wrestlers. I couldn’t have ever known when I was raising and lowering the microphone at Park Center, making popcorn at Crockett Park or selling t-shirts across the country, at well below minimum wage mind you (LOL), that my family was building a community of people that would still be around 85 years after my grandfather started his company. Let’s start with the fans, and YES, the best fans in the business! You’ve helped spread the word on social media, sent us messages, bought our swag and made donations all because you still remember what our name stands for. Quality. Integrity. Hard Work. I could never begin to tell you how overcome we have been with your ongoing support after all of these years. Thanks so much and keep up the good work! Your help and support with the Crockett Foundation will change the lives of both 2 legged and 4 legged heroes for the better. Now to our Tag Team Partners. Ricky Steamboat, Nickla “Baby Doll” Roberts and Ricky & Robert (R&R Express), you are the greatest!! I have been amazed by your generosity and your willingness to help. To be told by such incredibly busy folks that you are there to help, was humbling. Your support of my family and our Foundation has literally been incredible to say the least. I am forever in your debt. 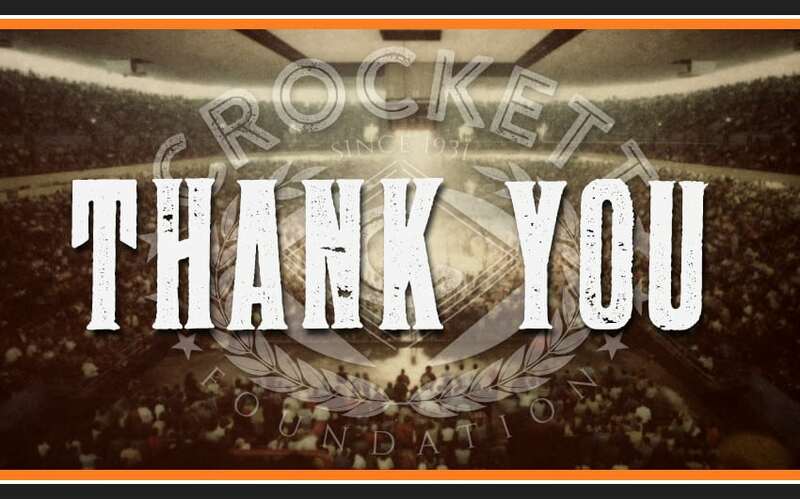 I hope that all of you know just how much we here at the Crockett Foundation appreciate each and every one of you. I know somewhere up there Big Jim is smiling down on all of us.